Young, 66 years old now, still gives his all and sounds the same as he did when he was in his 20’s. It’s some kind of special magic that he is the only person on stage performing, and still sounds like a full band that is playing every song. He switches from guitar to piano often and belts out classic tunes as well as some new ones. I loved that there were titles of each song and what year they were released that popped up on screen during each tune that was performed. The songs that were performed were Peaceful Valley Boulevard, Ohio, Down by the River, Sign of Love, Rumbling, Love and War, Leia, After the Gold Rush, I Believe in You, My, My, Hey, Hey (Out of the Blue), You Never Call,Hitchhiker, and Walk With Me. A wonderful set-list to see on film. Demme’s use of cameras during the concert was incredible. He uses unorthodox angles to showcase the artist’s creativity and mood. It’s very poetic and rock n’ roll at the same time. One of the more unusual shots was an HD lipstick camera that was mounted to the mic stand where we only see Young’s throat and mouth. At one point, a little bit of spittle from Young attacks the camera and it stays there for the duration of the song. It’s as if we are that close to his genius. There are psychedelic visuals at times and shots from inside his piano looking up at Neil playing. I loved this aspect of it as it was a very artistic way of watching a concert. The sound of the film was spectacular. It’s as of we were actually at Massey Hall watching Young perform live. That is possible from the 96khz recording of the music and film. My whole body rattled when the bass sounded. If I closed my eyes, it was as if I was there in person. 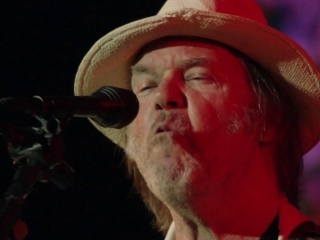 ‘Journeys’ is by no means the ultimate Neil Young concert film. It’s less pleasing than his many other documentaries, but non-the-less a good addition to the archives. Technically, ‘Journeys’ is astounding. It sounds amazing and the camera angles are powerful. This film is definitely worth a look to fans of his music, and Demme does a great job of capturing this time of his life. This entry was posted on Thursday, July 19th, 2012 at 6:10 pm	and is filed under Film, Music, News. You can follow any responses to this entry through the RSS 2.0 feed. You can skip to the end and leave a response. Pinging is currently not allowed. I just saved my dad. From what? Heart attack by watching curling on TV?